It’s official: no one cares about book blogs in Trump’s America. I’m exaggerating a little, of course. After all, you’re here. But the fact is that our daily page views are lower than they’ve been since the pre-Outlander years. For myself, I haven’t read more than 20 pages of the same book since Election Day – unless you count that I read the first 20 pages of Gods without Men twice. Yes, the election of Donald Trump has made me question the judgment and decency of somewhat less than half of my fellow Americans, and it has also made me consider the possibility that I have been seeking answers in the wrong places – that we all have, and that relearning where to look for answers is our central task from here on out. But on a personal note, the confusion of the past week has made me want to get busy. Finish revising the novel and write like a million more. Compose first drafts of short stories in the Notes section of my phone. Seek out collaborators. Try out new genres. Dust off my iambic pentameter. And maybe, on occasion, finish something. And by finish something, I am not referring to the Obnoxiously Orange scarf, which is still plugging along at the rate of a few rows a day. But it makes a nice backdrop for my Kindle in the photo, no? J.D. Vance’s Hillbilly Elegy comes highly recommended, and I’m enjoying it so far. I’ve read exactly 20 pages. 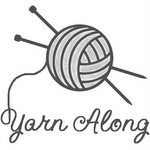 Yarn Along is hosted by Ginny on her beautiful blog, Small Things. I love everything about this post and agree that the best reaction to the last week is to get creative! Yes! Yes! Yes! 🙂 I don’t have a kindle. I’m stuck in the “old-fashioned” book. I haven’t read a lot the last few weeks. Looking forward to holding a book and getting busy! Old-fashioned books are my favorite too — but I do like the price of Kindle books and the convenience for traveling. I found your blog through Ginny’s. I’ve not heard of that book before but will check into it. I respectfully disagree about President elect Trump. I voted for him and I think I’m pretty decent and have good judgement unless confronted by a chocolate cake. Then my judgement is out the window. I voted for him because I believe he was the better choice to fix the economy, the illegal immigration problem, the lack of jobs especially in the inner city and so on. And concerning the popular vote, when you take into account the illegals that voted (thanks to the encouragement of President Obama) and the 13,000+ felons who were allowed to vote in the state of Virginia and also add in the absentee ballots that have not been counted, the popular vote winner could very well have been Trump. I hope that you don’t mind me commenting about this. My blog isn’t political just plain home stuff. The Virginia thing is true and as a Virginian Libertarian I am proud of it. Not to get too political, but I believe the right to vote should not be taken away from citizens- period. Committing a felony is horrid, but the people pardoned served their time, then their probation and parole. Then they have to personally request their voting rights be restored. When you look at the fact that so many in America don’t vote- I have a hard time seeing how one can be against this. Thanks, Valerie – I look forward to checking it out. I tend to agree that felons should retain the right to vote – but I get that right now the law says they can’t and that law should be enforced. I’m looking forward to checking out the source you cited. Another quick follow-up – I read the link and realized that I misunderstood the original statement a bit. Yes, I definitely agree that felons who have served all of their time should have the right to petition for restoration of their rights. I’m not from Virginia but support this 100%. Thanks! I find that the echo chambers that have been created, hopefully inadvertently through social media algorithms meant to streamline ads, but instead streamline ideas, are causing one of the biggest issues in exchanging ideas across ideological divides. Some very interesting comments here, and a great review as always. Thanks — your words “hopefully inadvertently” really struck a chord with me. I’ve learned quite a bit more since last week about how demographically cut off I’ve been from other parts of the country, and this is the issue that I most want to research and understand.